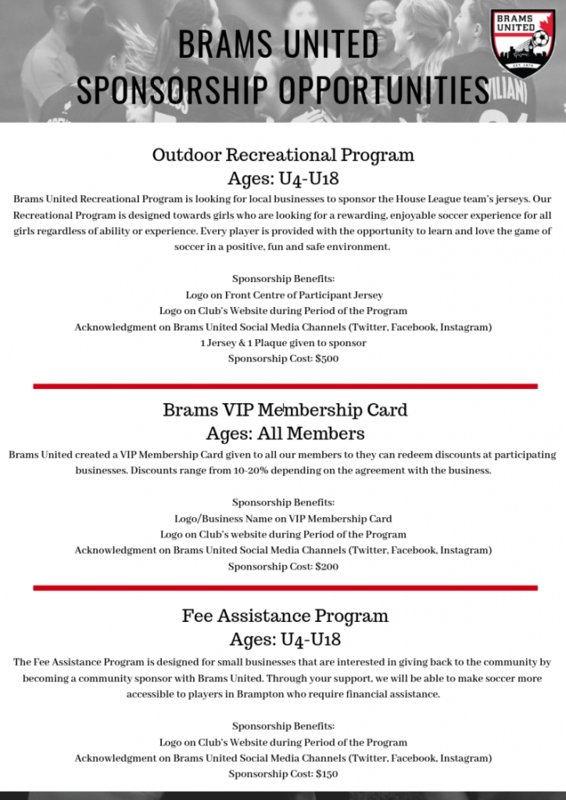 Brams United Girls Soccer Club is a non-profit, community focus, volunteer driven organization which, through its soccer programs, nurtures a healthy and active lifestyle for our female members and their families. Our coaching philosophy is to provide a positive environment that allows all female soccer players to gain confidence, mature as individuals and learn life long skills through the universal game of soccer. The club's funding is entirely dependent upon the contributions and support of local businesses and partners, along with member registration fees. We want to promote your business with our many club/team sponsorship opportunities. Get maximum exposure for your business and support your community of female soccer players. Please contact our Sponsorship Coordinator Kiefer at: kiefer@bramsunited.ca and find out how Brams United Soccer Club can help!